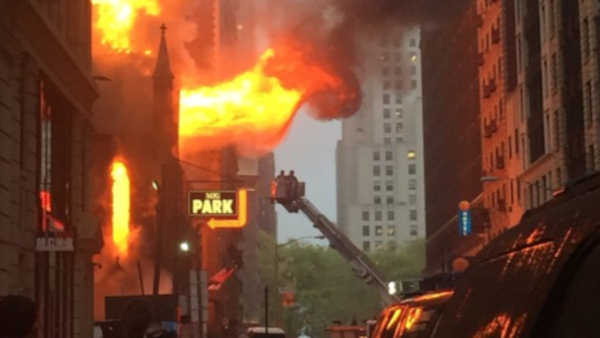 FLATIRON, Manhattan (WABC) -- A historic church in Manhattan that was gutted by fire was "compromised", but the structure still could be saved, the city Buildings Department said Tuesday. Flames ravaged the Serbian Orthodox Cathedral of St. Sava on 25th and Broadway in Chelsea on May 1st. "Based upon our preliminary investigation, we believe it may be possible to stabilize the structure while ensuring that public safety is not compromised," Alexander Schnell, a spokesman for the buildings department said. "While the Department's review of the stability of the property is ongoing, a preliminary determination was made that the structure is compromised," the spokesman said. "Once we conclude our investigation in the coming days, we will determine what steps must be taken to mitigate any safety risks posed by the property." The church itself posted a Sunday bulletin on its web site that read, "As the remaining church walls are determined to be unstable during inclement weather and winds exceeding 25 mph, the DOB has, based on engineering recommendation, reached a decision to demolish the church." But the Buildings Department said it has not reached a final determination for the church, which dates back to 1855 and was designated an official city landmark in 1968. And instead, believes "it is possible to stabilize the structure." More than 160 firefighters battled the 6-alarm fire on the most holy day on the Orthodox calendar. The historic church was built in the 1850s as an Episcopal church. The literary giant Edith Wharton was married at Saint Sava, and mentions the chapel in her book, 'The Age of Innocence. In 1942, the building was sold to the Serbian Orthodox Church for $30,000.